We all have moments, or even days, when we find focusing on work more difficult than usual. Sometimes the reasons are obvious, but other times we are stuck wondering what we are doing wrong and what’s happening to us. In this article we are going to explore these less recognizable factors that impair our ability to concentrate and properly accomplish our tasks. If you find yourself in the position of having to accomplish something that falls into one of these categories, Bailey recommends a short escape. Get out for a coffee or a hotdog and freshen up your mind before resuming work. Yes, sometimes people distract themselves from work by… working. Make-work is when you come up with different work tasks that make you avoid the real tasks you should be working on. It is basically a form of procrastination that tricks you into thinking that you are not procrastinating. Like checking out and replying to unimportant and not urgent work emails, or researching your next project, or organizing your folders and cleaning your desk. Instead, you should make a schedule at the beginning of each day and stick to it. This might not sound like a real reason, but recent studies discovered a strong link between mild dehydration and impaired cognitive performance. If you are waiting to drink water only when you feel thirsty, it means you are already experiencing mild dehydration. Avoid it by drinking a glass of water every hour. Keep it on your desk so you won’t have to lose time and interrupt focus in order to get it. Doctors recommend drinking somewhere between 0.5 to 1 ounce of water per pound of body weight each day, depending on the season and weather conditions. You might be surprised to see what a deep connection there is between proper hydration and your focusing ability. Some people might claim that they work better under pressure. However, feeling overwhelmed can have a dramatic impact over your focusing strength. More and more companies make great efforts to reduce stress among their employees, applying different strategies from allowing them to work remotely to even cutting the work week to four days. If your company isn’t among those, you need to take matter into your own hands and find strategies to reduce work pressure: take strategic breaks, ask to be allowed to work remotely at least one day a week, and most importantly leave work at the office. Allowing work to take over your personal life is a sure path to burnout. Draw boundaries between your work and personal life and take a break whenever you feel overwhelmed. As a busy professional, you probably have a lot of things to do every single day. But if you start working on a task, then remember to reply to some emails, then go back to your task to only be distracted by the first thing that comes up, you will never be able to keep focus. Multitasking can trick you into feeling that you accomplish many things at the same time, but in the end, it will take you longer to do work of a lower quality. Avoid the chaos by creating a system to help you deal with other things that might come up while you are in the middle of something. Keep some post-its next to your keyboard and note down the things that need to be done after you finish the current task. Phone, sweet phone – the gadget that is your best friend is also the greatest distraction. Most millennials feel the need to check their phone at least once every ten minutes. Studies show that the presence of a smartphone in sight reduces cognitive capacity. Simply having the phone on your desk, even face-down is making it harder for you to keep focusing and affect your capacity to make decisions. Therefore, before you start working, try putting the phone away in a drawer, in your bag, or in another room. Aiming high might be a good strategy for success in general, but overcrowding your daily schedule with too many tasks can make you feel overwhelmed really fast and spiral into chaos. More to that, failing to deliver everything you set your mind to do will have a negative impact over your emotional health, making it even harder to succeed. Don’t push yourself to do too hard. Divide your tasks into smaller chunks and take one step at a time. Too many employees are used to just grab a sandwich and eat it in front of the computer, thinking they are saving precious time. But research by Organizational Dynamics shows that is actually counterproductive. 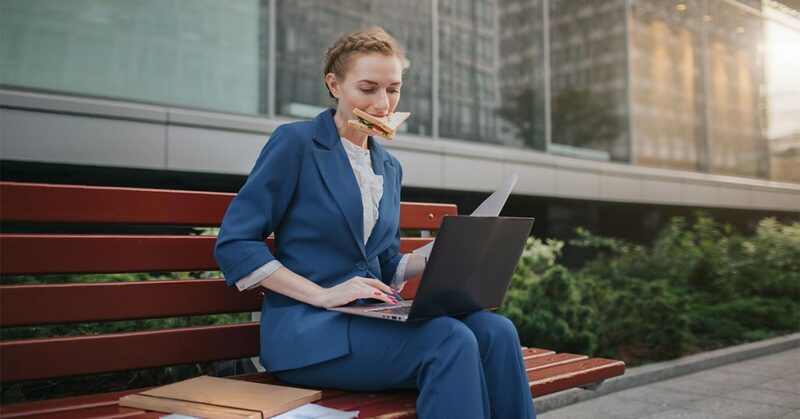 Lunch breaks are important, as they help people regain energy and keep a high job performance during the second part of the day. Breaks help your brain reset and make you feel more energized and less fatigued. To empower your focusing at work, make sure to take at least 30 minutes lunch breaks, and some micro-breaks during the work day. Sleep deprivation is a serious concern among the working population. U.S. companies have estimated productivity losses of about $63 billion a year due to sleep deprivation among their employees. Lack of sleep impairs our cognitive capacity, with the biggest impact over our ability to focus. A person who doesn’t get enough sleep displays the same symptoms as those of ADD or ADHD. Therefore, it is absolutely crucial to make sleep a priority and get those 7-8 hours that most doctors recommend every night. If you think some of the issues discussed above are the reasons why you’re having a hard time focusing at work, you clearly need to do some changes in your life. Get enough sleep, drink enough water, take often breaks and don’t be too hard on yourself. Set realistic goals, hold on to your schedule and things are surely going to improve.